I have just received word from the band that they will re-unite for a one off live show set to be played in Varberg, Sweden on April 16th 2016. What this means for the future I don't know as of now, although I know that Eucharist now owns all the rights to their discography again and that seems like good news indeed! I excpect to hear more news coming from the band shortly. The band has also provided me with a new official e-mail adress: eucharistofficial@gmail.com. The official Facebook page has also been updated, and a twitter page has also been created. You'll find them here: Facebook | Twitter. This site will also undergo a makeover in the near future! 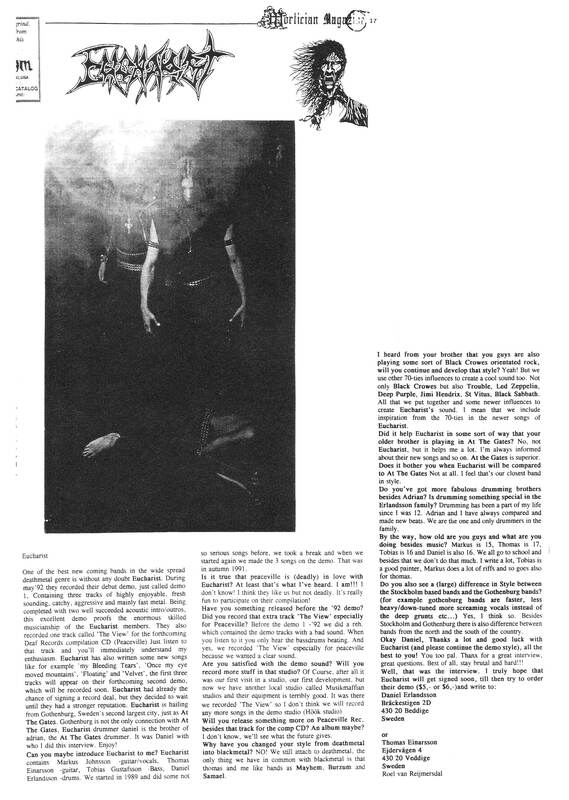 Added an interview from a Chilean zine from 1992. Thanks to Osvaldo for mailing the pics. You'll find the interview here. Osvaldo also sent me a band picture and a band flyer which is to be found in the photos section. I also added a bunch of old W.A.R Records flyers, sent to me by Frido Stolte. You'll find them in the photos section. KRIZZZ mailed me two new tabs. This time it's Bloodred Stars and Demons. Check them out in the music section. A guy called KRIZZ e-mailed me two of his own Eucharist tabs, Greeting Immortality and The View. The tabs are awesome! They are available in the music section. Thanks KRIZZZ! I added an interview from the Mortician Magazine from 1993. Thanks to Martijn for sending me that one. You'll find it here and in the band section. Also, be sure to check out the Eucharist MySpace site, maintained by Martijn aswell. I fixed the broken thumbnails on the music-section, and added an interview in the band-section (thanks Ralf!). I will probably upload some mp3's in a near future, first I'll have to get Markus' approval. I moved the site to a new and hopefully faster serer. I wil also upload some mp3's for you. The new, totally re-done, Eucharist website is now online! This 2nd installement of the site is a vast improvement from the first one. I think the band finally got the website they deserve. I can with big certainty say that this is the biggest Eucharist resource on the net. Enjoy!